Rev it up, turn it loose ... and take the time to savor the enduring charms of the Mother Road, from ghost towns to city lights, from Glenrio to Gallup. Come take a ride. The passenger door is open. We have a 19-foot-long shell-pink and iridescent-lavender American automobile to take us down the road. Some days, as the early-summer sun shakes down from the sky on Central Avenue in Albuquerque, I think the thrum of the Hemi engine in my 1956 DeSoto Fireflite may be the sweetest sound in creation. It’s Route 66 that amplifies it, that turns it from a rumble of machine parts into a reverberation that echoes back and forth through time, calling out to travelers both nostalgic and forward-looking. Originally commissioned in 1926, Route 66 stretches its concrete arms across eight states, including a nibble off the corner of Kansas. New Mexico is the proud parent of more than 600 miles of the Mother Road (including discontinued stretches, aka alignments). 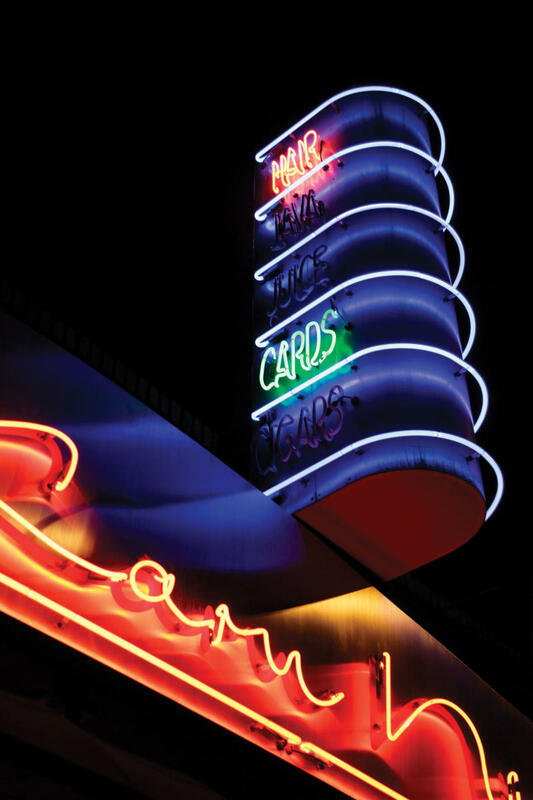 The route is embellished with whimsical neon signs, fortified by classic diners, and smoothed by retro motels. I live just five blocks away from Route 66—close enough to feel its soul coursing across the state, connecting communities, and tying New Mexico into the long-ago dreams of a country that discovered how four wheels and a full tank could feel like freedom unbound. U.S. Route 66 was fully and finally decommissioned in 1985, leaving it up to the states to mark the old road with historic signs to guide drivers on their journeys. Even so, Route 66 remains alive with commerce, international sightseers, and locals rediscovering its allure. You don’t need a befinned beast of a car to fall in love with Route 66 in New Mexico (though I highly recommend it). You just need a taste for mid-20th-century Americana, the eyes of a traveler, and the beating heart of an adventurer. Let’s ride. Above: A Tucumcari sidewalk. Photograph by Jeremy Wade Shockley. Nighttime is the right time to cruise 66 when you’re on the hunt for eye-catching neon spectaculars. The charming Tee Pee Curios (575-461-3773; on Facebook), in Tucumcari, lures tourists into the old-school gift shop with a glowing cactus. Don’t miss the Dog House Drive In (1216 Central Ave. NW, Albuquerque; 505-243- 1019) hot dog restaurant. The building is unassuming by day, but night finds it lit up with a delightful dachshund chowing down on moving neon hot dogs. It famously appeared in scenes from the Albuquerque-based show Breaking Bad. In Gallup, Motel Row offers up the Jetsons-esque Lariat Lodge marquee and the gaily colored, tree-shaped Blue Spruce Lodge sign. On Route 66, the varied landscapes of New Mexico unfold dramatically. Coming from the Texas state line, take in the wide-open rangeland where thunderstorms gather from miles away and the tips of distant mountains beckon you forward. At the top of Nine Mile Hill, on Central Avenue in Albuquerque, pause to appreciate the Río Grande Valley, laid out in a green ribbon of cottonwoods below. As you continue toward the west, just past Prewitt, the red Entrada sandstone bluffs blaze along the roadside like an eternal sunset. Stop in at Red Rock Park (exit 26 from I-40; 505-722-3839) in Church Rock, near Gallup, for a picnic against a backdrop of cliffs formed during the time of the dinosaurs. Whether you use a smartphone or a digital camera with all the bells and whistles, iconic Route 66 offers lots of photo fodder. Tucumcari’s flashy chrome Route 66 monument on the west end of town is a good place to begin. On Instagram? Add your photos to this article’s series by sharing them with the #route66nm hashtag. To add treasure hunting to your journey, search geocaching.com for hidden stashes near your location. Geocaching involves seeking out hidden objects using GPS coordinates posted by other hobbyists. New Mexico’s stretch of Route 66 includes a tiny box hidden in the metal trusses of the Río Puerco Bridge, with a logbook of visitors, and a stash in Old Town Albuquerque that takes seekers on a ghost tour before arriving at the secret cache’s final location. Document your search and share the photos at geocaching.com. 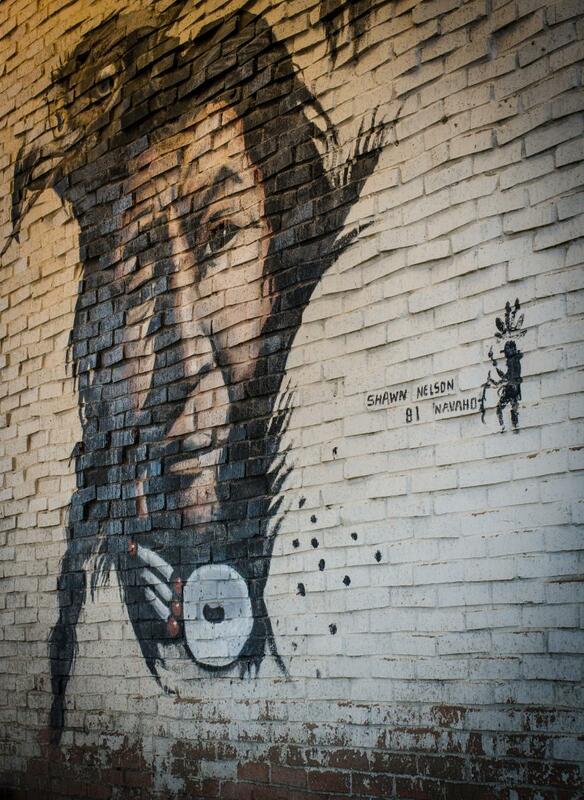 Above: Shawn Nelson&apos;s mural portrait of a Native American man, in Gallup. Photograph by Jeremy Wade Shockley. Route 66 followed many different directions in its time. Old sections were retired to give way to new, more streamlined thoroughfares. One of the most famous discontinued sections can be found in the ghost town of La Bajada (meaning “the Descent”), at the bottom of the steep hill of the same name (exit 264 from I-25). It offers a stimulating uphill hike, perfect for shaking off road-trip stiffness. Its series of harrowing switchbacks challenged cars and their drivers back in the day. Look for the stacks of rocks supporting the old road. Park near the bottom and hike up the curving remnants. New Mexico’s temperate climate and dry weather help to keep old cars in good condition. That’s part of why the communities along Route 66 are so full of classic car owners. If you don’t have one of your own, you can still immerse yourself in a sea of retro automobiles at the Route 66 Auto Museum, in Santa Rosa (575-472-1966; route66automuseum. com). There you’ll find everything from classic Chevys to flame-kissed street rods. You can also track down a local car show through the New Mexico Council of Car Clubs (on Facebook) and get your fill of souped-up muscle cars, well-preserved Mustangs, and Frankenstein rat rods crafted from spare parts. 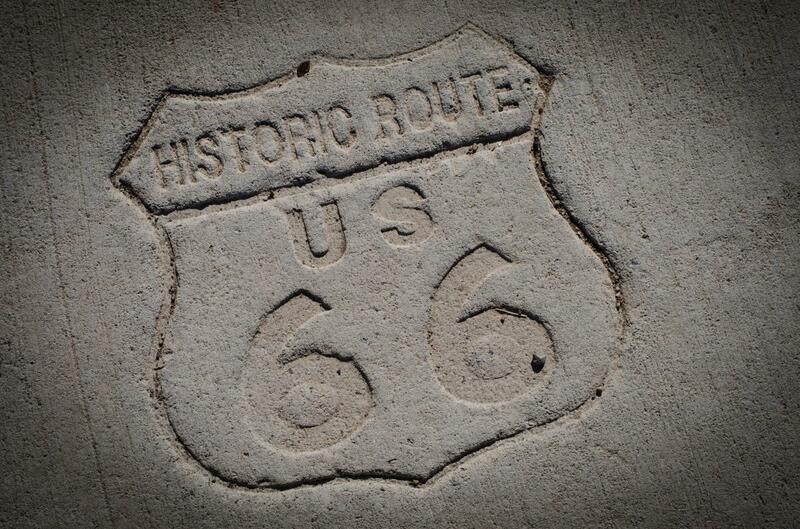 The path Route 66 traces through the state was a hub of activity long before automobiles were invented. As you travel west of Albuquerque to Grants, Route 66 follows closely alongside I-40 and the scenery evolves into glinting fields of black lava rock. Stop at the Northwest New Mexico Visitor Center, off exit 85, for an introduction to the stark volcanic beauty of El Malpais National Monument (505- 783-4774; nps.gov/elma). Before 1937, Route 66 followed the Old Pecos Trail, now unified with I-25 south of Las Vegas. This old alignment passes by Pecos National Historical Park (505-757-7241; nps.gov/peco). Explore the village ruins, reconstructed kivas, and mission church in the footsteps of Pueblo ancestors, Spanish conquistadors, and settlers who found new life in the West. In Gallup, enjoy Route 66’s well-preserved, still-vibrant charms in the form of shops, restaurants, and more. Pick up a Pendleton wool blanket and a wide-brimmed Stetson cowboy hat at Zimmerman’s (213 W. Highway 66; 505-863-3142). Silver Dust Trading Co. specializes in beads, but also houses a room-length showcase featuring jewelry from nearby Zuni Pueblo, with delicate geometric inlays of tiny turquoise stones (505-722-4848; silverdusttrading. com). Eat at Earl’s Family Restaurant, where country-fried steak and guacamole tostadas happily coexist on the menu (1400 E. Highway 66; 505-863-4201). The complimentary salsa will goose your taste buds. Walk in the footsteps of Hollywood’s greatest at the El Rancho Hotel (505- 863-9311; route66hotels.org). Humphrey Bogart, Mae West, and Katharine Hepburn all stayed here during the heyday of western filmmaking. Take in the curved staircases, giant geode, and movie star photos in the two-story lobby. Order a margarita at the 49er Lounge or fill up on enchiladas at the restaurant. The Old West feel of the building makes for an enthralling stop. 16. A Museum that’s Dino-mite! During Albuquerque’s Route 66 Summerfest (July 18–20), the entire Nob Hill stretch of Route 66 is closed off, giving pedestrians a rare opportunity to shop, stroll, and even dance in the street to live music (rt66central. com). Over in Tucumcari, Rockabilly on the Route, a four-day celebration of early rock ’n’ roll and cool cars, begins June 5 (rockabillyontheroute.com). Pompadours aren’t mandatory, but they would fit right in. Arrive there in style on the New Mexico Route 66 Association–sponsored Motor Tour (rt66nm.org), which revs up in Gallup on June 5 and follows the post-1937 route until it meets up with Tucumcari’s Wheels on 66 Classic Car Show (wheelson66.com) and the rockabilly festival mentioned above. On the way to Tucumcari, participants pull over on Friday night for an outdoor movie, which is as close as you’ll get to a drive-in theater experience on Route 66 in New Mexico. Bring your own car, classic or contemporary, and enjoy the ride. Many small communities that once thrived on the movement of people and cars along the old road became ghost towns after I-40 came along. San Jon, 19 miles west of the Texas state line, once had a reputation for rough-and-tumble cowboy nightlife in the early 1900s. Now it displays the fragments of closed auto shops with fading ghost signs proclaiming its place on the Mother Road. Pause to view the lovely remnants of the stone church in Cuervo, 42 miles west of Tucumcari. Snap a postcardperfect photo of your vehicle parked at the abandoned Budville Trading Post, in Budville, 24 miles east of Grants. Above: Neon signs on the 66 include Laru Ni Hati Salon and Wine Bar. Photograph by Julien McRoberts. In the 1920s, architecturally modish movie palaces sprang up all over the country. Two that survived are on or near Route 66. Recently renovated, Albuquerque’s KiMo Theatre is a glorious Pueblo Deco–style building from 1927, with Native American motifs throughout. Buffalo skulls with glowing eyes watch from above the stage (505-768-3544; mynm .us/abqkimo). In Gallup, the Spanish Colonial Revival El Morro Theatre is one block off 66. It opened in 1928 and is operated by the city (207 W. Coal Avenue; 505-726-0050). Catch special movies, music, and theater events at both venues. The legend of Route 66 is larger than life, and so are some of the advertising sculptures created years ago as beacons to travelers. Tucumcari’s La Cita Restaurant & Flowers (820 S. 1st St.; 575-461-7866) is topped by a Paul Bunyan–worthy sombrero. Giant fiberglass statues known as the Muffler Men are scattered across the country. Many of them can still be spotted along Route 66. One of New Mexico’s behemoths resides at 416 W. Coal Avenue in Gallup. The “Dude Man,” so named for his cowboy hat, is visible from Route 66 up on his rooftop perch. Santa Rosa surprises Route 66 travelers with its status as a mecca for scuba divers. While the landscape around the town is pure ranch country, an 80-foot-deep natural pool draws in visitors from around the world. The Blue Hole beckons divers and swimmers with a constant 64-degree temperature and crystal-clear views below the surface. Look for crawfish, goldfish, and sculptures left by other divers (575-472- 3404; bit.ly/BlueHole). If you’re a certified diver, bring your scuba certification card and pick up a diving permit at the Santa Rosa visitor center (575-472-3763; santarosanm.org). Stop in at the Santa Rosa Dive Center next to the Blue Hole for tank rentals and refills on weekends. If you’re not a diver and you don’t mind the temperature, bring your swimsuit for a recreational paddle around the surface. into the space-themed environs of Launchpad for uptempo local and touring bands. Drive: Route 66 merges with the frontage road on the westbound side of I-40. Take this to the scenic 1933 Río Puerco steel truss bridge (17 miles), which is now open to foot traffic only. Take I-40 from here. Drive 37 miles and park for a pic at the pumps at the Budville Trading Post (exit 104). Take old 66 through San Fidel and rejoin I-40 just past the towering remnants of a Whiting Brothers store sign. Get off at exit 85 (20 miles) to follow Route 66 through Grants’ strip of signs advertising bygone businesses like the Lavaland Motel and the Roarin’ 20’s bar. Rejoin I-40 at the Continental Divide (36 miles).